PTMSC Blog : Kelp Kelp Kelp! When we think of a forest, a few things come to mind. Many of us think of trees, plants, animals and, massive amounts of biodiversity. Forests are highly productive ecosystems on land. However, forests exist in the sea as well. Kelp forests are important ocean ecosystems which exist along coasts all over the world. Here in the Salish Sea we have these forests around us, as well. Just as the forests on land provide habitat, these ecosystems also provide habitat, food, and shelter for many marine species. The Salish Sea has two types of canopy-forming kelp: giant kelp and bull kelp. Giant kelp grows on the western coast of Washington down to Baja California. It doesn’t extend past the Strait of Juan de Fuca. Giant kelp has a different anatomy than bull kelp and its forests are where you find sea otters. Bull kelp grows in the Salish Sea, as well as the west coast, and you’ve probably seen it washed up on the beaches around Port Townsend. It is part of an ecosystem that plays an important role in keeping the Salish Sea so productive. Fish use bull kelp as a nursery and others graze on its blades for food. It even protects our beaches. Bull kelp is a type of brown algae and not a vascular plant. It consists of a holdfast which anchors it to rocky substrates. A long stipe acts as the stem of the kelp, and it stretches up to a bulb at one end which contains gasses to help it stay buoyant. This buoyancy allows for the kelp to float to the surface of the water and receive more sunlight. The leaf-like blades of the bull kelp are where most of the photosynthesis and nutrient uptake takes place. All parts of the kelp photosynthesize and absorb nutrients through the water. 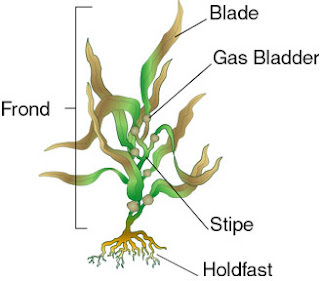 During the summer months, it can grow more than a foot per day, up to 115 feet from holdfast to the blade tips. Kelp forests provide many ecosystem services. It’s especially important for juvenile rockfish, forage fish, and salmon. This makes them vital for commercial fisheries. Bull kelp is also a very important food source for abalone, urchins, and other invertebrates. Bull kelp is a buffer against wave action and currents protecting coastal areas from erosion. 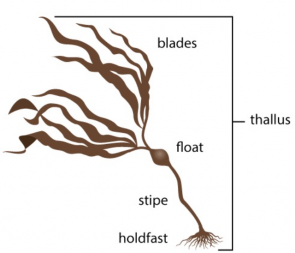 Bull kelp faces some stressors. Water quality is important for healthy kelp beds. If too much sediment gets washed out into kelp beds, it can block sunlight and reduce productivity. Runoff containing chemicals such as herbicides also impact kelp forests. One of the consumers of bull kelp in the Salish Sea is urchins. Urchins are normally kept in check by sea stars, but when sea star wasting disease devastated sea star populations, urchin predation decreased. With more urchins, it is a concern that they may negatively impact kelp forests. This April, when we re-open our Marine Exhibit for the 2018 season, we will be focusing on nearshore habitats of the Salish Sea. One of our tanks will showcase kelp forests. We hope everyone can come see this amazing alga!